See the Road to Launch Image Gallery. The GOES-R and GOES-S launch vehicle is an Atlas V 541 expendable launch vehicle (ELV). The term expendable launch vehicle means each vehicle is only used once. The three numbers in the 541 designation signify a payload fairing, or nose cone, that is approximately 5 meters (16.4 feet) in diameter; four solid-rocket boosters fastened alongside the central common core booster; and a one-engine Centaur upper stage. GOES-R launched aboard an Atlas V 541 rocket from Space Launch Complex-41 at Cape Canaveral Air Force Station, Florida, on November 19, 2016. GOES-S also utilized an Atlas V 541 when it launched from the same location on March 1, 2018. A launch vehicle is chosen based on how much mass the vehicle can lift into space. 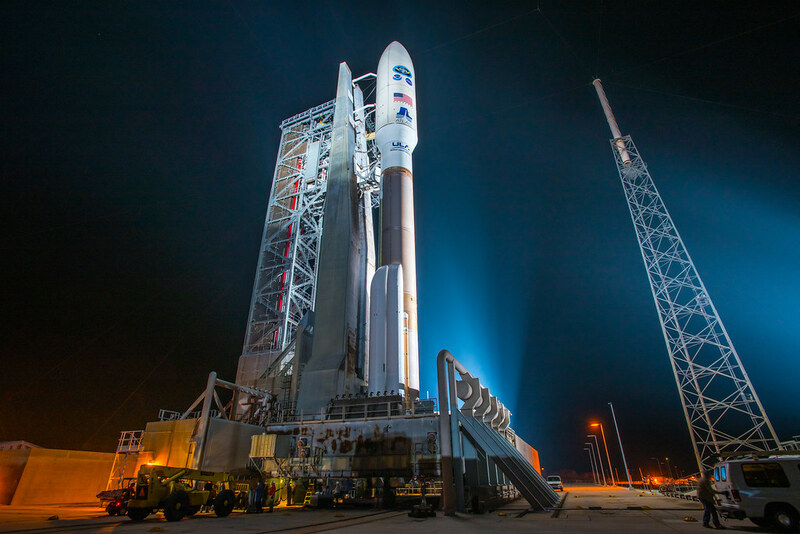 A two-stage Atlas V 541 launch vehicle was selected for the GOES-R and S launches because it has the right liftoff capability for the heavy weight requirements. NASA Kennedy Space Center awarded the launch services contract for the GOES-R and GOES-S satellites to United Launch Alliance of Centennial, Colorado, in April 2012.